Four good friends lived in the forest near a lake. Every day Mouse, Crow, Turtle and Deer met to drink at the lake. Every day they talked and told each other good stories. One day Deer did not come to the lake to drink water or to visit. Mouse, Crow and Turtle were worried. "I saw a Hunter in the forest this morning," said Crow. "I am afraid that Deer might be hurt. "Fly over the forest, Crow," said Mouse. "Please see if you can find our friend Deer." Crow flew over the forest. It took only moments before Crow saw Deer caught in a trap made of ropes. She flew back right away to get her friends to help Deer escape the trap. When the other animals arrived, Mouse began to chew the ropes with her teeth. Crow pecked at the ropes with his beak. Turtle just talked to Deer to help her calm. "Why did you come here?" asked Deer. "Friends are supposed to help each other," said Turtle. "We are your friends and we came to help you escape the Hunter's trap." Just then, the Hunter came to check his trap. "Everyone, leave quickly," said Turtle. Crow flew away fast. Deer ran down the path. Mouse ran into the bushes to hide. Turtle lifted a foot and had almost set it down to take a step as the Hunter walked up. "My trap is empty," said the hunter. "But, a Turtle is better than nothing. I will eat Turtle soup tonight." The Hunter tied Turtle's feet together so he could not walk away. Then he picked him up and started for home. "What will we do?" asked Deer. "You all helped me. Now we must all help our friend Turtle." Deer ran to get ahead of the Hunter. She laid down on the path and pretended to be dead. 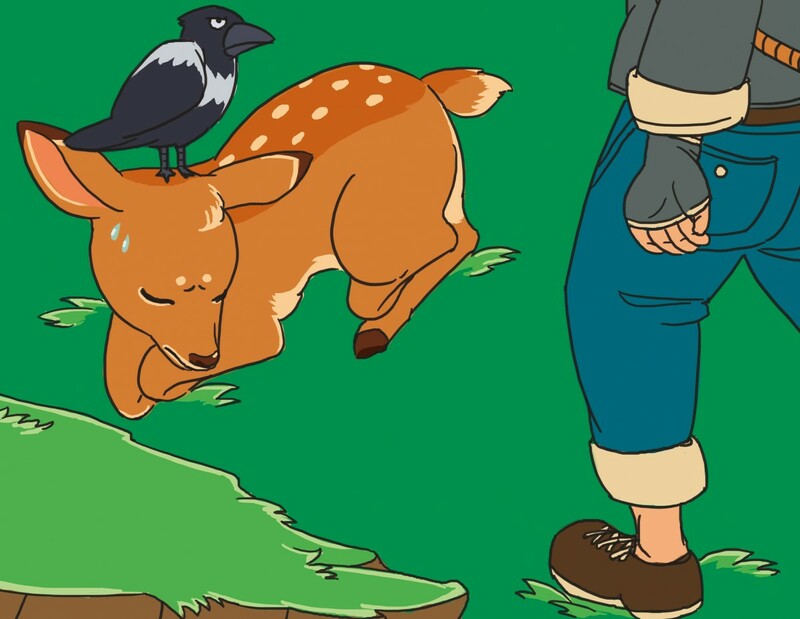 Crow flew ahead of the hunter and landed on Deer's head. The Hunter saw the Deer. He sat Turtle down to go and get the Deer. As quickly as the Hunter left Turtle, Mouse ran up and cut the ropes off Turtle's feet. Turtle and Mouse stepped off the path to hide in the forest. Crow flew away. Deer got up and ran fast to escape the Hunter. The four friends met later at the lake to drink water together and to tell their other friends about the narrow escape. The Hunter went back to get Turtle, but he found him gone. "There is magic at work here," he said to himself. Then he ran out of the forest to never come back again. There was magic in the forest that day. That magic is called friendship. May you always be blessed with the magic that comes from having good friends.